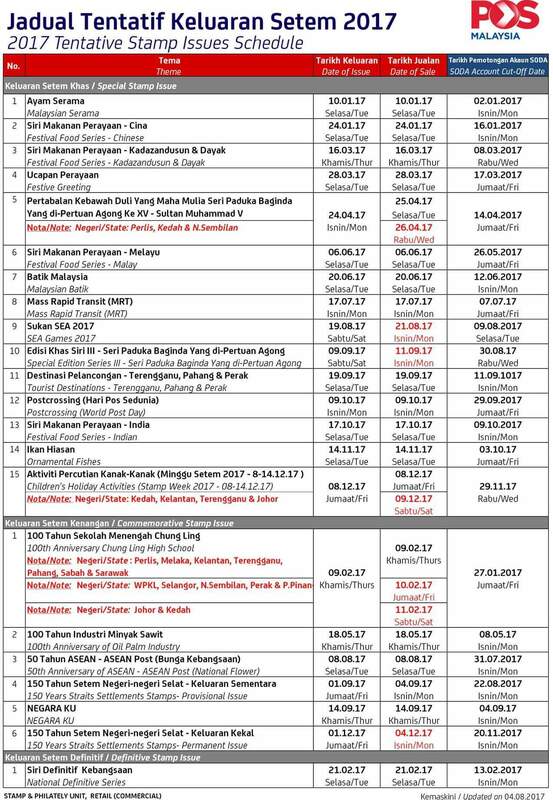 Here is the updated Malaysia Stamp Schedule. The main addition is the second issue of Straits Settlements stamps in December 2017. I will write on this topic later on. Meanwhile the next issue is just around the corner, i.e. SEA Games 2017. Refer to the “150 years of Straits Settlement” Stamp issues; What is the difference between “provisional issue” and “permanent issue”? The confusion arise from the translation. Provisional is a correct translation as on 01 September 1867, Straits Settlements used India stamps with an overprint as a provisional issue. Subsequently in December of the same year, the regular issues with the words Straits Settlements on the stamps were issued. The word “Regular” might be a less confusing word than “Permanent”. The words combined with “issue” gives rise to further confusion on stamp issue. The word issue is meant to refer to the stamp issue type in 1867 and not the stamp issue now. Try reading up the philatelic history of Straits Settlements to get the whole picture. OIC. Thanks for the clarification!